and tendons that stabilize the shoulder. the rotator cuffs, which comprise the m. infraspinatus, which arises from beneith the scapula at the fossa infraspinata scapulae and facilitates internal rotation, the m. supraspinatus, which is situated right above the former and is involved in the lateral adduction of the arm, and the m. teres minor, which is attached laterally to the scapula at the margo lateralis scapulae and figures in the abduction of the arm; the m subscapalaris, which completes this commonly overlooked muscular quartet attaches to the inner part of the scapula and facilitates internal rotation, abduction and adduction of the shoulder. Navigate the SuppVersity EMG Series - Click on the desired body part to see the optimal exercises. I probably will never get tired of telling you that complete isolation, as in "petri-dish" experiments, is nothing you will be able to achieve in the gym - not even if you use one of those fancy new devices, the name of which would suggest that they would facilitate exactly that ;-) In the real world (and, believe it or not, the gym is part of it) your muscles will always work synergistically to move the weight from point A to point B. It is however very well possible to influence which muscle group and even which individual muscle takes the lion's share of the workload by selecting the right exercises and / or manipulating the way you perform a given exercise.Always remember this, when you take a look at the following list of the "most effective exercises" (correctly I should say the exercises with the highest EMG activity). The EMG data in figure 1 confirms what trainers all over the world have been propagating for decades. A pressing movement for the front delt (anterior part), some lateral raises for the lateral part and a few reverse flys for the posterior delts is all it really takes to built "cannon-ball delts". 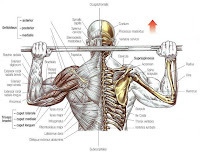 Another common wisdom, which says that front raises were among the most effective exercises for the anterior deltoid, on the other hand, gets busted. Even done with your ams externally rotated, the DB front raise is 41% less effective than the "gold standard", the barbell military press. A possible reason (and major drawback of all EMG data) for the "inferior" activation of front delt by the DB front raise are significantly lighter loads compared to the BB military press. If the subjects had used 120lbs for the military press, but only 25pounds per DB for front raises, for example, the muscle activity per pound of weight for the DB front raise would in fact have been roughly tree times higher - 929µV/120lbs=7.71 for the BB military press vs. 548µV/25lbs=21.92 for the DB front raise. That being said it stands out of question that, within a volume program, there certainly is a place for an isolation exercise such as the DB front raise, even if it is not a classic "mass building" exercise, the outstanding characteristic of which is maximal muscular overload, after all. Exercise tip: While the respective EMG values for dumbbell exercises have not been measured in the study, it is very likely that exercises such as the DB overhead press provide an extra stimulus over their barbell equivalent that is related to the more natural arch of motion, where you get a good stretch at the bottom and can really squeeze the muscles in the contracted position, when the dumbbells approach (they do not cling!) each other at the top of the movement. That being said, the DB overhead press is also a viable alternative for the BB neck press as the position center of gravity is more in line with your head throughout the movement. It may thus be assumed that the the stimulus shifts away from the front and towards the lateral deltoid, as it is the case with the neck vs. the military press. Form, I cannot emphasize that enough, becomes more and more important with lighter weights, and as your shoulder is peculiarly prone to injury and generally much weaker than your legs, for example, it is not only advisable, but simply a matter of physical limitations to use lighter weights. That being said, the previously cited example of the DB front raise shows that lighter weights do not equal inferior muscle stimulation, as - done properly - respective isolation exercises generate way more torque per pound of weight you are handling than their mass building counterparts. Form does yet not only determine overall intensity, the way you are doing your shoulder exercises also has a profound influence on the degree to which the three parts of your deltoids are activated. Doing DB lateral raises internally rotated, for example, reduced the activation of the lateral part of your delts by -16%, using a neutral, i.e. a hammer grip (thumbs facing up) was associated with a -12% reduction in EMG activity. 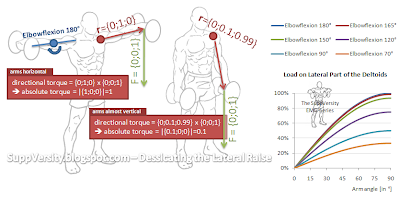 In the case of the DB reverse fly the use of an arm to torso angle of 45°, instead of 90°, reduces the load on the lateral part of the deltoids by -29% and gripping the handles of the reverse fly machine from the out- instead of the inside (external vs. internal rotation of the arm), takes away -20% of the stimulus (cf. figure 2). If you make good use of what you have learned at the end of the previous paragraph, you can improve the load on the target muscle, while handling lighter weights and decreasing your risk of injury - I know, the big weights are more impressive, but after all what's the use of using the biggest weights, if you are not making progress, both strength- and size-wise, because of improper form? I mean, it is one thing to cheat on the last 1-2 reps of a set in order to squeeze out the very last drops of gasoline from your muscular tanks, it is however something completely different to compromise form, just to be "the guy who lifts the heavy weights". There is hardly any movement, where this becomes so obvious as with the DB lateral raise. If you do not do it yourself, you certainly know someone who grabs the 50lbs dumbbells, holds them vertically before his groin and then powers, or I should say, "rips" them up to his sides, lets them bang down and starts all over again until, after he eventually racked the weights, he grabs his shoulder or wrist in agony, yet not without the pride of having used a heavier weight than the guy next to him. Note: The following analysis is based on a VERY simple mechanical model and does not consider factors such as increased load per square area of muscle fiber in the stretched position, effects of static or complete contraction etc... Notwithstanding, if you like the following part of this write-up, please spread the word (via Facebook, Twitter, etc.) and let me know (in the comment section or the SuppVersity Facebook page) that it would be worth the effort to do similar and even more depth analysis in the future! You already know from the previous paragraphs and the EMG data in figure 2, that it is imperative to keep the arms externally rotated, i.e. to pretend you were trying to pour out an imaginary liquid from the dumbbell at the top of the movement, if you do not want to lose 16% of the muscle tension in the first place... Well, but what about the aforementioned guy who does not even get the chance to think about pouring out any liquid other than that in his shaker bottle, when he is performing his ballistic weight exercises? 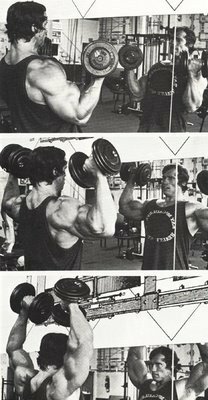 Which of his mistakes, do you think compromises the effectiveness of the lateral raise most? Well, from a physical perspective, which always provides a very selective and (over-)simplified view of reality, the answer would be "1. flexing the elbow too much". Surprised? While raising the dumbbells to 75°, takes away less than 5% of the torque (cf. 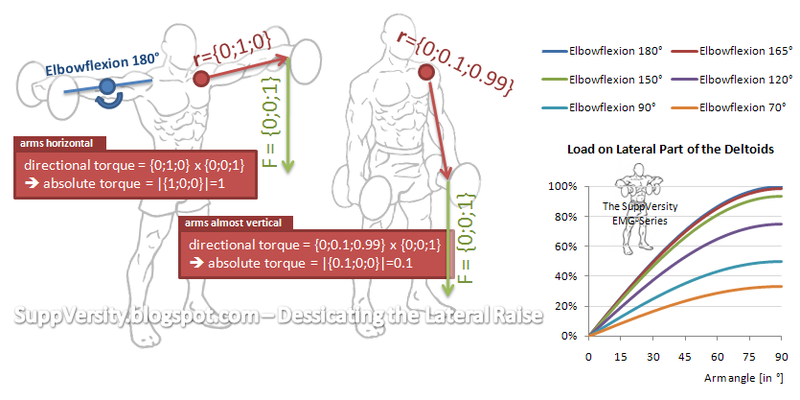 figure 3), flexing the elbow to 90° reduces the torque on the lateral parts of your deltaoids have to overcome by a whopping -50%! Think about that, when you look at the guy with the 50lbs dumbbells the next time you are at the gym. Chances are that you, with your 30lbs DBs are way stronger than he is, as long as you do not give in and reduce your elbow flexion more than those 15% that relieve some of the stress on the joint, but only minimally reduce the torque on the muscle. One of my pro hockey players, Jim McKenzie, improved his 14-inch, close-grip bench by 51 pounds in 12 weeks, from 280 to 331 pounds, by focusing on rotator cuff strength. A pros pos external rotations as the data in figure 4 goes to show this is by far the best isolation exercise for the muscles of the rotator cuff. In essence, it does not really matter if you want to do them with a dumbbell standing, lying on the floor or with an elbow on a bench, or if you prefer doing them using a cable pulley. The differences are negligible, in view of the huge difference improper exercise execution would make - so you better do an exercise you like with light weights and feel the muscle working than an exercise that has been shown in study XYZ to be the most effective with a weight you can hardly handle and where you do not feel the target muscles working. This, by the way applies to the static doorway pushback, which is basically an "inverted pectoral stretch" where you push with the backside of your arm (angle arms/torso 90°) backwards against an immobile object like a doorway, as well. If you do not feel like this static exercise is working for you chose a different one. Isolating the m. supraspinatus with lateral raises: According to Jobe & Moynes (1986) the DB lateral raises performed with a 30° horizontal adduction of the arms fully isolates the m. supraspinatus if you rotate your shoulders so that your palms are facing the floor (the good old "emptying the bottle" technique). Doing 1-2 sets of lateral raises this way certainly is a time efficient way of incorporating a strengthening exercise for the upper part of the rotator cuff into your routine. You will have to use much lighter weights than on regular lateral raises, though. You may notice that I do not make volume (i.e. set) recommendations. This is due to the fact that I found that everyone has to find what works best for him / her in terms of optimal volume, training frequency and body part splits. This may also change over time / according to lifestyle factors / nutrition and supplementation.